One interesting aspect to these explanations’ presence is most researchers believe their explanation is the leading one. It is a symptom of the state of climate science: specialization proliferation leads to poor cross-disciplinary communication. Someone might have this within their purview, but I am currently unaware whether anyone is apportioning relative causality of these explanations together. Attribution is challenging, of course, but such an effort seems worthwhile to me. Categories: global warming, science | Tags: climate change, global warming hiatus, global warming pause, Interdecadal Pacific Oscillation, natural variability, oceanic heat uptake, solar irradiance, volanoes, volcanic activity | Permalink. Climate change skeptics used the recent slowdown in observed surface warming to claim that 20th century warming was temporary and that the Earth would return to lower average annual temperatures. They offered up many potential explanations for the slowdown, none of which make physical sense. The Sun’s 11-year cycle (often used to explain away warming), a primary argument brought forth, is not the reason: this cycle’s solar maximum is near at hand, yet warming has slowed down recently. Recently accepted research points to a viable physical explanation. In addition to oceanic transport of heat to the deep ocean and recent La Nina events, sulfuric emissions from small and mid-sized volcanoes entered the lower stratosphere and reflected more incoming solar radiation than normal. This research separated the effect of natural sulfur emissions from anthropogenic emissions, using a model, to determine the former had a much larger influence than thought. Aerosol optical depth (AOD) is a calculated metric used to represent how opaque or transparent the atmosphere is to different radiation wavelengths. 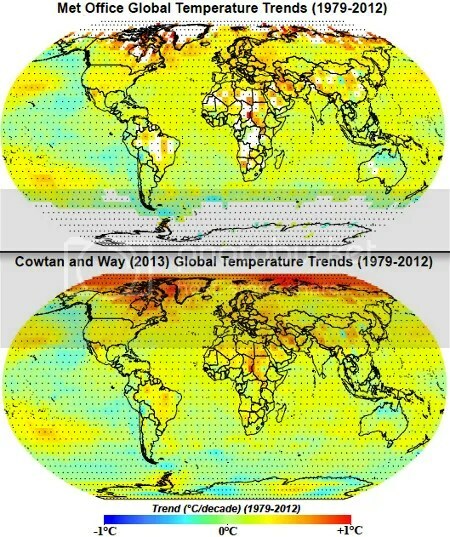 The layer between 20 and 30 km increased 4-10% per year since 2000, which is a significant change from normal conditions – significant enough to have effects on Earth’s climate. As the caption says, satellite measurements are denoted by the thick black curve. 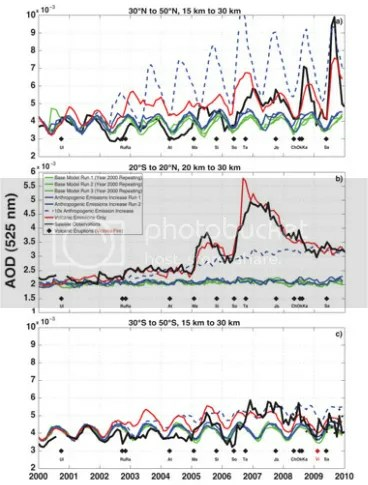 Note the large increase in AOD (higher opacity) over the tropics in the mid-2000s (b) and the large AOD increase over the northern mid-latitudes in the late-2000s (a). While not a perfect fit to the observations, the model run with volcanic eruptions (red curve) does the best job of explaining the origin of the SO2. Individual eruptions are indicated by black diamonds on the bottom of each sub-plot. The effects of volcanic eruptions on climate are, in a general sense, well-known. Injections of SO2 into the stratosphere reflects sunlight, which reduces the amount of energy entering the Earth’s climate system. The difference between one large-scale eruption (e.g. Pinatubo in 1991) or many mid-sized eruptions in a short time-period (see above) is not large as far as the climate is concerned. This could be good news as far as the climate is concerned, at least in the shorth-term. 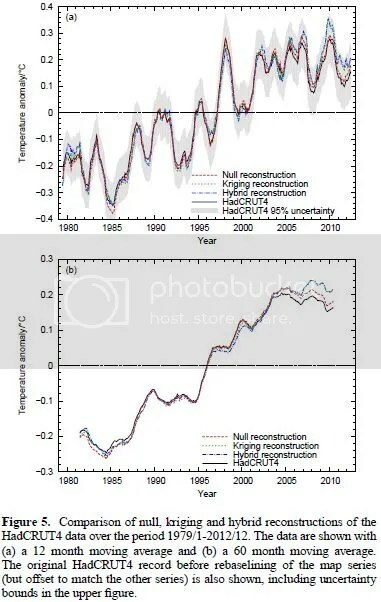 If incoming energy were reflected back into space instead of being stored in the system, we can physically explain the observed temperature trend slowdown (see Figure 2) and treat the slowdown as real instead of waiting for that energy to transfer from the oceans to the atmosphere, for example. The significant portion of the radiative forcing due to increases in stratospheric aerosol from 2000 to 2010, interpreted as a mechanism of global cooling [Solomon et al., 2011], may now be completely attributed to volcanic sources and should not be considered a trend. Rather, the stratospheric aerosol layer should be treated as a natural source of radiative forcing that is continuously perturbed by volcanic injections of a range of sizes, and potentially other sources such as large fires. Figure 2. Global mean surface temperature anomaly maps and 12-month running mean time series through January 2013 from NASA. We can see from the 12-month running mean time series (lower-right in Figure 2) that NASA’s temperature index increased more slowly during the latter part of the 2000s than the 1990s. Neely et al. suggest that there is no physical reason to conclude that slowdown is a trend of opposite sign than that seen throughout the 20th century. In other words, once the SO2 precipitates from the stratosphere, as it eventually will, the background warming trend will re-establish itself. Indeed, future warming will likely be stronger than past warming because CO2 concentrations have not decreased in the past ten years. To the contrary, they have increased at a faster rate than before. Greenhouse gases have simply had less incoming radiation to absorb than they did 10 years ago due to the recent presence of SO2 in the stratosphere. This situation provides a good example of another aspect of climate policy. I wrote about geoengineering earlier this year as part of a Polar Sea Ice post (much more discussion took place here). One proposed mechanism to reduce the impacts of climate change is human injection of SO2 into the stratosphere, which would mimic natural volcanic effects. If we implemented such a strategy without simultaneously reducing atmospheric greenhouse gas concentrations, then abruptly stopped the injection (due to lack of funds or international controversy), the resulting warming signal would be higher post-injection than pre-injection. The result would be unprecedented due to the large warming signal such a halt would introduce to the climate system. In one more respect then, policymakers have wasted the past decade. Instead of developing and implementing climate mitigation policies, international inaction continued. Once the atmosphere removes the SO2, the climate signal will be stronger than before. We cannot and should not rely on future volcanic SO2 emissions to mitigate our GHG emissions. The lack of robust policies is a choice, but it is not a wise long-term choice. Categories: global warming, policy, science | Tags: aersosol optical depth, climate policy, climate science, geoengineering, global warming, policy, solar cycle, sulfur dioxide, volcanic activity, volcanic aerosols, volcanic cooling | Permalink.